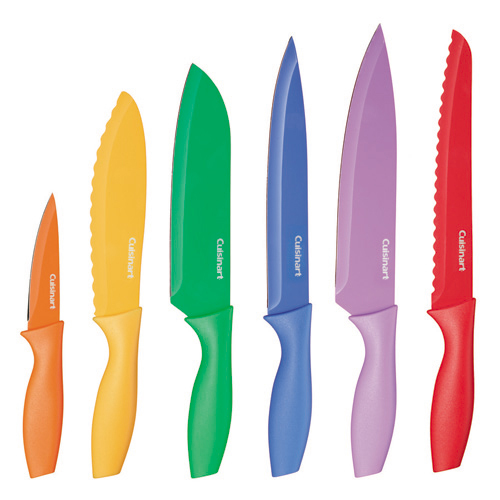 The Cuisinart C55-01-12PCKS is a 12-piece professional-quality stainless steel knives. It featues cutting-edge, non-stick coating that makes slicing easier and has color coding to avoid cross contamination during food preparation. These knives comes with matching blade guards and ergonomic handles. The 12 Piece Colored Knife Set Knife Set has many exciting features for users of all types. See the 12 Piece Colored Knife Set Knife Set product video above for more details. The 12 Piece Colored Knife Set Knife Set is sold as a Brand New Unopened Item.